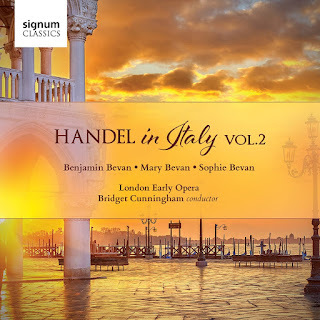 The second volume of Bridget Cunningham and London Early Opera's Handel in Italy on Signum Classics, sees them joined by sopranos Mary Bevan and Sophie Bevan and baritone Benjamin Bevan for a further selection of items from Handel's Italian period (see my review of the first volume). Like the previous volume, the disc mixes complete works (cantatas Poiche giuraro Amore HWV 148 and Dalla guerra amorosa HWV 102a, trios Quel fior che all'alba ride HWV 200 and Se tu non lasci amore HWV 201a, the Sonata in G minor HWV 580 and Concerto in G major HWV 487) with extracts from longer works including items from Nisi Dominus HWV 238, Il Trionfo del Tempo e del Disinganno HWV 46a, Aci, Galatea e polifemo HWV 72 plus the overture to Agrippina HWV 6. The intention is to give us as wide a range of Handel's activities in Italy as possible, covering his operas, oratorios and sacred music, as well as his own keyboard playing and the vocal chamber duets and trios which were an important, and relatively neglected, part of his output. The disc opens with a four track sequence, selected from three works (Agrippina, Nis Dominus and Il Tionfo del Tempo e del Disinganno) which gets over the sheer brevity of some of the tracks by creating a satisfying pasticcio whole. We start with the overture from Agrippina (Handel's first opera for Italy, premiered in 1709) which is suitably grand and characterful with some lovely oboe playing, followed by a tiny lyrical arioso from the psalm setting Nisi Dominus (written for the Carmelite Church in Rome in 1707) sung by Benjamin Bevan, which is so short you really want a bit more. Finally a recitative and aria Tu del Ciel ministro eletto from the oratorio Il Trionfo del Tempo e del Disinganno (written for Rome in 1707). These latter two are sung by Sophie Bevan. The aria opens with a lovely violin solo, followed by Sophie Bevan's poised account of the soprano solo as she spins long elegant lines. Next comes a complete cantata Poiche giurare Amore for soprano and continuo, written for the Marchese Ruspoli (one of Handel's major Italian patrons) in 1707. We have to imagine Handel accompanying the cantata himself with a soprano such as Margherita Durastantini performing to a select audience at one of Marchese Ruspoli's salons. The remarkable thing about Handel's Italian career was that he was never a servant, never on the staff, instead he was a house guest of a selection of patrons (Ruspoli included) who provided bed and board and exhibited him to their guests. The cantata takes as is subject Love, this time failed love - 'Since love and unfaithful Clori swore to make such eternal war on me'. In the opening recitative Mary Bevan gives full weight to the words and the performers bring out the drama. The first aria has a complex, rather wandering melody which Mary Bevan makes beautifully expressive with some lovely ornaments in the repeat. The second recitative leads to the vivid final aria, with words really spat out. Bridget Cunningham plays a pair of keyboard works, the single movement Sonata in G minor and the two-movement Concerto in G major, which may in fact be arrangements of other works, but the handful of keyboard works by Handel from this period are the closest that we can come to the reports of his dazzling prowess at the keyboard. The Larghetto movement of the Sonata in G minor is gently elegant, followed by the perky and jolly Allegro of the Concerto, and then the elegantly melodic final Andante. The cantata Dall guerra amorosa for bass voice, sung here by Benjamin Bevan, seems to have been written whilst Handel was in Rome, and may have been written for the bass who sang the role of Lucifer in Handel's La Resurezzione. 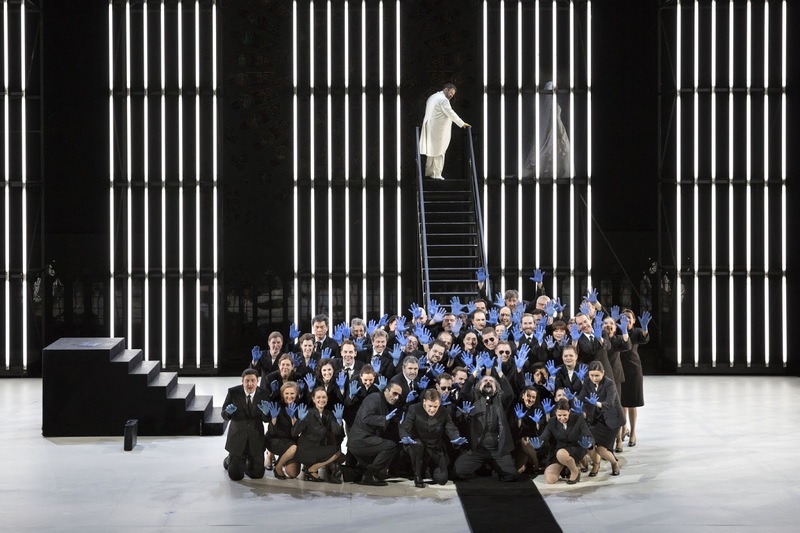 The cantata uses the metaphor of fleeing from the war of love, being better to flee than to be defeated by Amor. A short but vivid recitative leads to the jolly first aria, though Benjamin Bevan's passage work is inclined to be rather smudgy at times, then the second recitative leads to the slower final aria. The melody here is wandering and rather striking, though Benjamin Bevan's performance is sometimes on the over careful side. The cantata finishes with a short but vigorous final section which ends the cantata in a remarkably abrupt way, perhaps to indicate that the singer really does flee! 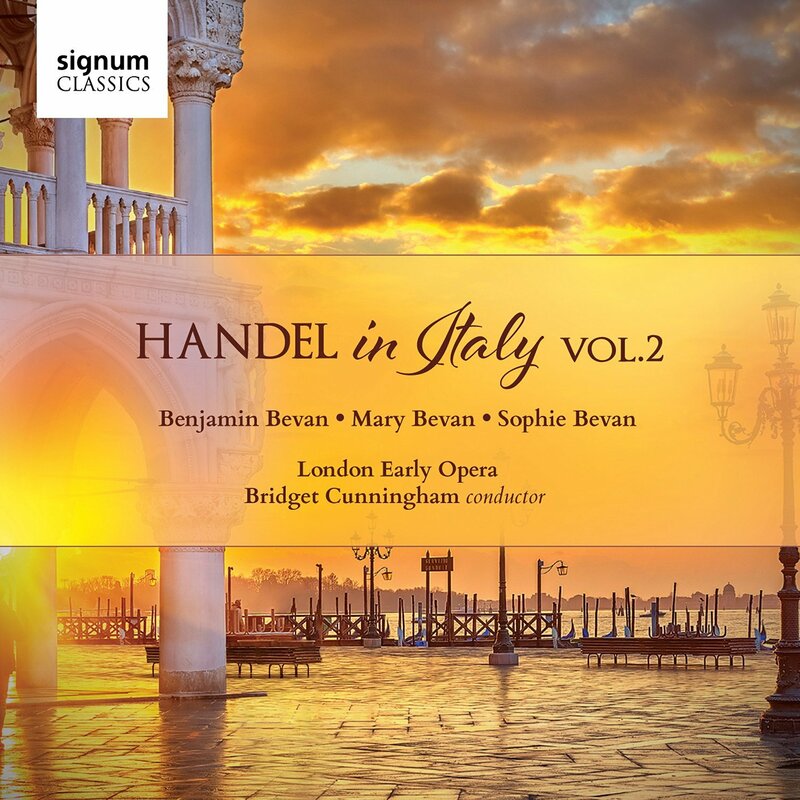 Benjamin Bevan is also the soloist in Precipitoso nel mar che freme, Polifemo's aria from the serenata Aci, Galatea e Polifemo which Handel wrote for Naples in 1708, possibly for an aristocratic wedding. Benjamin Bevan and the orchestra bring out the vividness of the music with real vigour as Polifemo rages. Finally we have a pair of trios for three voices and continuo. Throughout his career Handel returned to vocal chamber music, frequently writing duets (some of which he famously re-cycled as choruses in Messiah). Here we have vocal trios, and these show us Handel experimenting with another style entirely. These are not aria-like, and unlike the cantatas, cannot be seen as dummy runs for larger operatic ventures. Instead Handel is evoking the monody of the stile nova and the polyphonic madrigal. 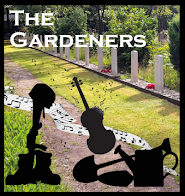 Remarkably, they are not da capo but instead are through composed, reflecting the dramatic flow of the words. The writing is often canonic, and full of well-made polyphonic writing of a type we rather more associate with Bach. 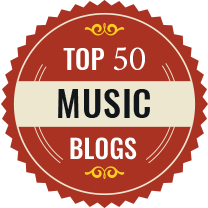 They throw and interesting and valuable light on the variety of Handel's genius in Italy. As with Bridget Cunningham and London Early Opera's previous Handel volumes, the delight of the programme is slightly marred by the relatively shortness of some of the extracts and the disc does rather leave you wanting more. Cunningham complements the music with admirably full notes, giving us both the historical and biographical background to the Handel's Italian sojourn as well as full details of the various pieces in the programme. To try and represent Handel's multi-faceted genius as displayed in his brilliant Italian period would be tricky in a longer boxed set, but it is to Bridget Cunningham and London Early Opera's credit that they manage to cram so much into the 55 minutes of this disc.